Update May 04, 2017, at 8:50 a.m. 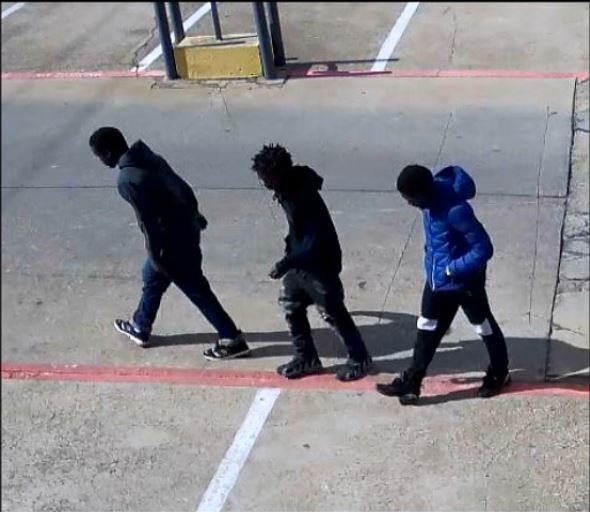 Through the course of the investigation, it was determined that two of the males identified from the surveillance video are Roemello Rashaud Gordon, a Black male 20-years-old and Jacquez Javon Gibbs, a Black male 18-years old. On May 3, 2017, with the help of the U.S. Marshal Fugitive Apprehension Strike Team, both suspects were arrested for capital murder and transported to the Dallas Police Homicide Unit to be interviewed. Both suspects were read their Miranda warning and waived their rights to remain silent by speaking with detectives. They both admitted to being at the location and their roles in the capital murder offense. They have both been placed in jail for capital murder, their bail is set at $500,000.00 each. Detectives are still seeking the public’s help in identifying the third individual known as “Lil Josh”. Anyone with information regarding this offense is encouraged to contact Homicide Detective Maudlin, #6468, at 214-671-3676 or brent.maudlin@dpd.ci.dallas.tx.us. Update April 27, 2017, at 3:00 p.m. Through the course of the investigation, video surveillance has been located regarding three persons of interest related to the death of Mark Burnough at 6910 S. Cockrell Hill Road. Detectives are asking for the public’s assistance in identifying these individuals. Anyone with information is encouraged to contact Homicide Detective Maudlin, #6468, at 214-671-3676 or brent.maudlin@dpd.ci.dallas.tx.us. On April 26, 2017, at approximately 4:40 p.m., Dallas officers responded to a shooting call at 6910 S. Cockrell Hill Road. The victim, Mark Burnough, a Black male 17-years-old, was shot during an altercation. He was transported to an area hospital where he died from his injuries. Anyone with information regarding this offense is encouraged to contact Homicide Detective Maudlin, #6468, at 214-671-3676 or brent.maudlin@dpd.ci.dallas.tx.us. Please refer to case #093182-2017.